This is a beautiful muscle car that gets up and goes without any hesitation. Comes with a matching strong 350 V-8 with the original 4 speed transmission. Comes with 4 wheel disc brakes and power steering. Black soft top is in good condition without any rips. The yellow exterior paint looks presentable. The black vinyl interior is in looks great without any rips or tears. Tilt steering and cruise control. The headlights go up and down the way they should as do the wipers. All the door panels are in great condition. The dash has no issues and the console looks good with a Delco AM/FM/Cassette player. Corvette rally chrome wheels are like new including tires. 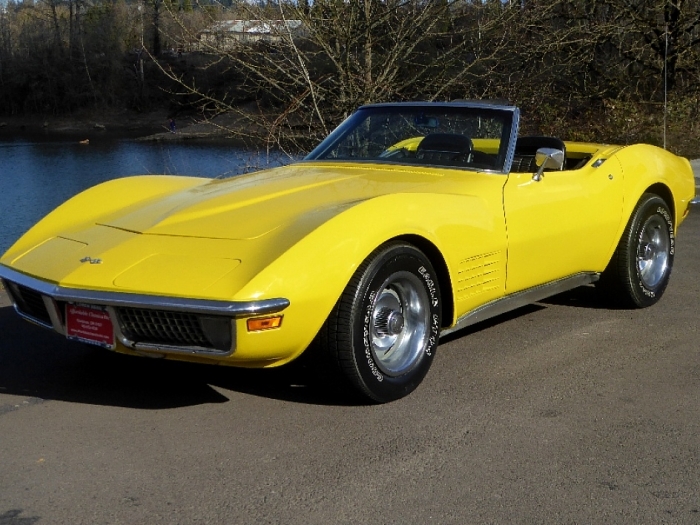 These Corvettes have been increasing in price through out the years.